Little balls of fur need washing, too. 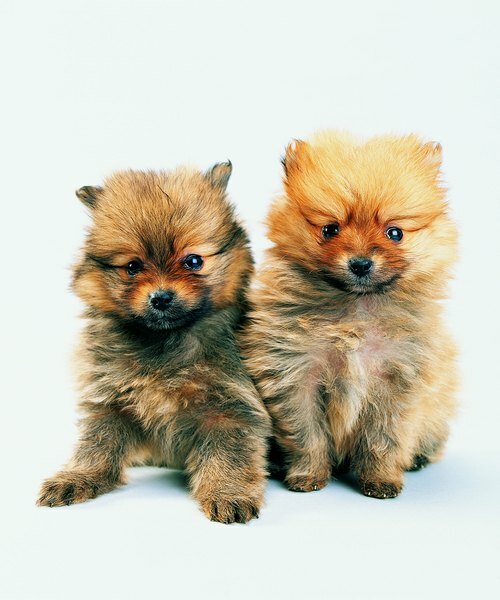 Pomeranians, with their vivacious spirit, make great companions and indoor pets. They're dogs that enjoy snuggling with their human counterparts; it benefits you all when you teach your pup how to stand still and get a proper bath. Start bathing your pom when she is about 8 weeks old. Place a plastic mat in the bottom of your kitchen or laundry sink; use a sink that is deep enough to keep your puppy from jumping out easily. Your puppy is not visiting a water park -- the mat will keep her from sliding around and getting nervous. It is important to make bath time enjoyable for your Pomeranian. Run about 3 inches of lukewarm water in the bottom of the sink. 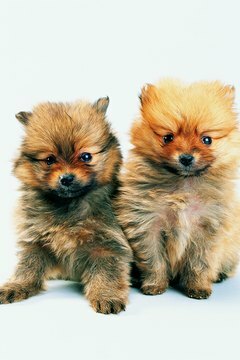 A Pomeranian puppy is generally around 4 to 6 inches tall and weighs less than 3 pounds; more water might seem like an ocean and could be harmful or pose a drowning risk. Set your fluffy pup in the water. Use a cup and dip the water up and wet your baby from the back of his head all of the way to his tail. Don’t get any water in his big brown eyes or perky ears; it could cause an infection. But pay special attention to the back of his ears and tail, where mats are common. Mix one part puppy-safe shampoo with eight parts water. Rub the shampoo mixture in your hand to form lather. Gently cover his coat with the foamy stuff. When bathing your pom, do not rub or scrub his hair. The long, coarse texture of his coat makes it susceptible to mats and tangles. Rinse your pom puppy twice with fresh water from the tap. Like the bathwater, the rinse water should be lukewarm. Continue to rinse until the water runs clear. Pomeranians are known for their thick top coats; make sure you rinse deep under that hair, down to his skin. Wet a clean washcloth with warm water and squeeze out the excess. Wash your baby's face with it. This helps prevent soap from getting in his eyes. Keeping the eye area clean helps prevent bacterial infections in the eyes, which can occur in poms. Dry the puppy with a clean, fluffy towel to absorb the water. Wrap him up and allow him to air dry. When he is ready, generally around 8 to 10 weeks old, introduce the blow dryer. Keep the setting on low and hold the dryer at least 10 to 12 inches from his skin. Always brush your pom before bathing her. This helps remove mats and tangles that can get worse when wet. Never leave shampoo on your puppy. It may cause him to have an allergic reaction or dry skin. Also, don't use human shampoo, which can be too harsh on the petite babies. Does a Vinegar Bath Help a Pug's Skin? How Often Should You Give a Boxer Puppy a Bath?